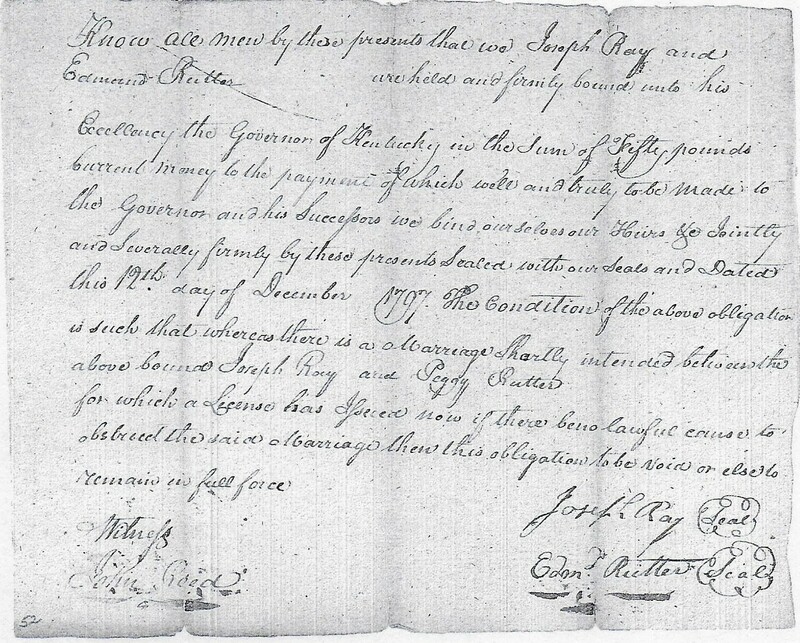 Know all men by these presents that we, Joseph Ray and Edmund Rutter, are held and firmly bound unto his Excellency, the Governor of Kentucky, in the sum of fifty pounds current money, to the payment of which well and truly to be made to the Governor and his successors. We bind ourselves, our heirs, jointly and severally, firmly by these presents, sealed with our seals and dated this 12th day of December 1797. The condition of the above obligation is such that whereas there is a marriage shortly intended between the above bound Joseph Ray and Peggy Rutter for which a license has issued. Now, if there be no lawful cause to obstruct the said marriage, then this obligation to be void or else to remain in full force. 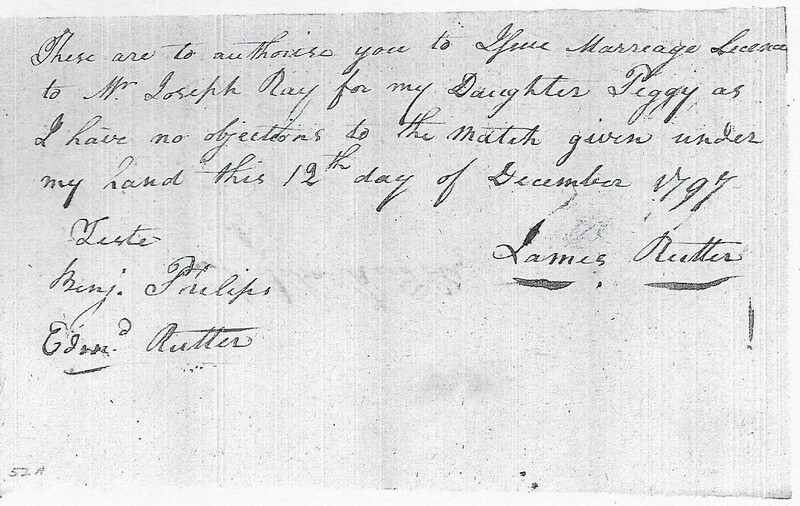 These are to authorize you to issue marriage license to Mr. Joseph Ray for my daughter Peggy, as I have no objections to the match. Given under my hand this 12th day of December 1797. Thank you Phyllis another family member in your posts. We are descendants of Nicholas through Francis and Rosey Coleman Ray. Oh that that Spencer ancestor’s family had been so thorough in having documentation that survived. 😉 Blessing to you, keep up the good work. How I wish I could be your shadow for a week. You are just so great doing all this. Thank you Thank you Thank you.